Funklicious Fridays has never gone exclusive with just one artist, but today’s a new day. We are going “Frantilicous” today with Michael Franti & Spearhead. After seeing Michael Franti & Spearhead on the Sailing Southern Ground cruise, I was nearly left speechless. There are moments you have in life where you just feel the positive energy in the air and are thankful to be alive. One of those came when Michael Franti & Spearhead sang Say Hey (I Love You) on the Sailing Southern Ground cruise. Here’s the video to start off your day in Frantilicious style! It’s perfect that this video takes place in Rio, a place where people have mastered simply “living for the day”. And, damn, can they move those hips! Next up, we have The Sound of Sunshine Video, which is the name and title track of Michael’s new release. Sample all the songs on this The Sound of Sunshine link. That beautiful waitress in the video is actually Jolene Rust from the band. Apparently, the girl who was suppose to shoot the video never showed up and so they asked Jolene to do it. Thankfully! Jolene was also Sailing Southern Ground and is even more luminescent in person. It is no wonder that her classmates at Monterey High want her to attend the reunion Read more of Joleen’s story here. And sorry, ladies and gentlemen, Jolene and Michael are together. A Michael Franti and Spearhead Classic. I have been on several music cruises including the Dave Matthews Band Cruise and The Rock Boat. When I went on the Sailing Southern Ground cruise, I knew I was in for another treat. 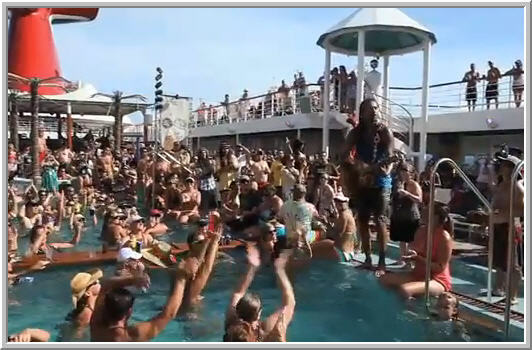 The headliners on any music cruise, in this case the Zac Brown Band, always step it up to a new level. But, the real treat of a music cruise is often that band that unexpectedly blows you away. In the case of Sailing Southern Ground, that band was Michael Franti & Spearhead. If you enjoyed the songs above, imagine them being played in the middle of the Caribbean with hundreds of people soaking up sun, life, dance, and lots of alcohol. It’s an experience second to none. I don’t know why I have never seen Michael Franti & Spearhead. I lived in San Francisco for many years and was often invited to shows but, for some reason or another, I never attended. My bad! Simply put, Michael Franti puts on a show that will blow you away. The depth, energy, and vibe are unprecedented. Now go enjoy the weekend, get a little “Frantilicious”, and Shake It, Shake It, Shake It! Ever Want to Feel Like This? Best Song On YouTube Ever – Rick Astley, Really? How Did Ricky Martin Have Twin Babies? What To Do When You’re Procrastinating?